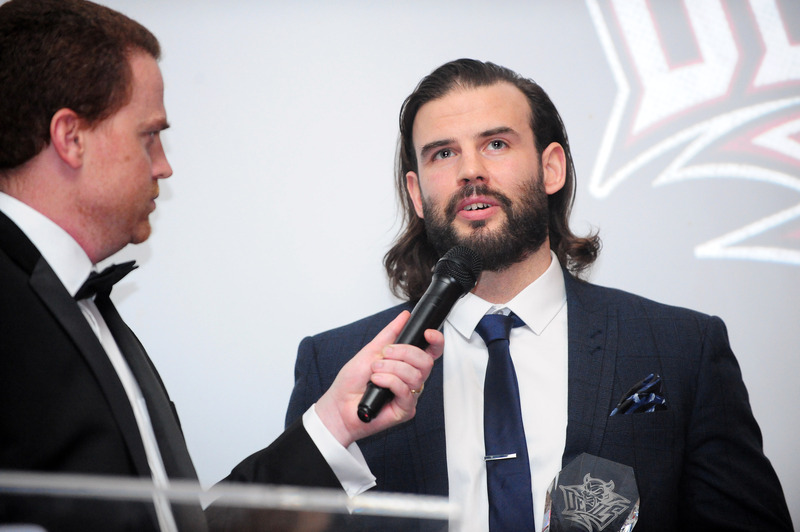 Devils' players player of the season Stephen Dixon being interviewed during the club's awards night. Pic: David Williams. Canadian centre Stephen Dixon insists it’s ‘redemption time’ for Cardiff Devils in the Elite League play-offs. Devils missed out on a third successive title when they lost their final regular season fixture in Coventry and finished runners-up to Belfast Giants after the rivals finished level on points. Cardiff clash with Sheffield Steelers over two matches in their play-off quarter-final and Dixon, voted players player of the season, says: “The way our League season ended was not how we hoped it would and now it’s redemption time. “There is one trophy left to win and we are focused on that. “It was pretty overwhelming to be voted players player. This is a special group of guys and it’s good to be respected by your peers. The hugely experienced Dixon, aged 33 and a former NHL draft pick for Pittsburgh Penguins, has played in the American League plus Sweden, Finland, Russia, Germany and now the UK. He will be one of Devils key players on their play-offs mission. Lord makes his Devils to Sheffield on Saturday for the first leg with the return being played at the Viola Arena in Cardiff Bay on Sunday (6pm). Stephen Dixon. Pic: Richard Murray. Steelers coach Tom Barrasso has come up with plans to stop Cardiff D-man Gleason Fournier, who scored a remarkable 71 points this season and was voted Devils Most Valuable Player at the club’s awards night. The former Detroit Red Wings NHL draftee has been in scintillating form and Barrasso says: “Fournier has been outstanding. He sees the ice well and is able to utilise the other skilled players around him. The play-off finals weekend is in Nottingham over the weekend of April 13 and 14.